The AI for Good series is the leading United Nations platform for dialogue on AI. It brings together leaders and experts from around the world to explore how AI can be used to improve the quality and sustainability of life on our planet and help achieve the United Nations’ Sustainable Development Goals. The summit continued to formulate strategies to ensure trusted, safe and inclusive development of AI technologies and equitable access to their benefits. ‘Breakthrough teams’ demonstrated the potential of AI to map poverty and aid with natural disasters using satellite imagery, how AI could assist the delivery of citizen-centric services in smart cities, and new opportunities for AI to help achieve Universal Health Coverage, and finally to help achieve transparency and explainability in AI algorithms. You can also view the presentation below. provided the opportunity for an exploration of Artificial intelligence (AI) in health in low and middle income (LMICs) countries by convening a diverse round-table dialogue including experts in AI, leaders in global health policy and delivery, and donors supporting global health. Our founder, Arun Shroff was an invited expert at the meeting and contributed to the dialogue and discussions, sharing insghts and their experience on the practical and ethical aspects of implementing AI solutiions for health. We are currently partnering with a national tele-ophthalmology group and conducting a field trial in over 150 screening centers for our automated solution for early detection of Diabetic Retinopathy. Patient’s retinal images are captured via Fundus Cameras at local screening centers or clinics, and are uploaded via the web to a cloud-based server for further processing. A cloud-based web application for patient registration and data entry, image capture and uploading, integration with the AI model, remote diagnosis by trained specialists, as well as patient reporting, messaging and notification. 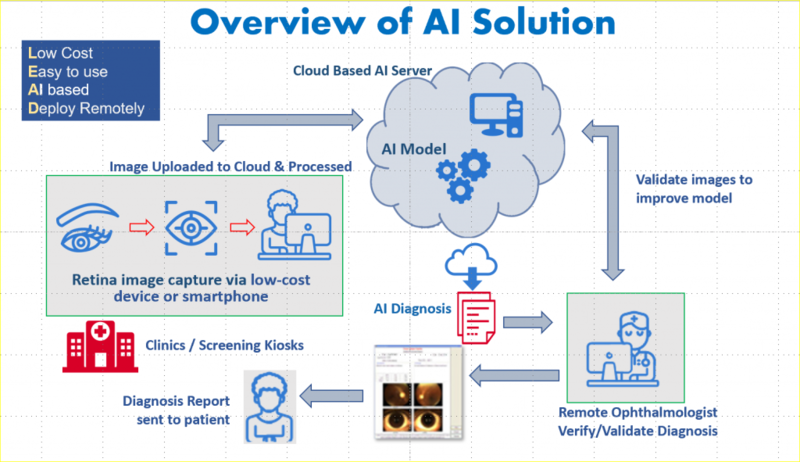 Automated AI Diagnosis: The AI model runs on a remote server and automatically diagnose and classify the image nearly instantly as either normal or showing evidence of DR, the stage of the DR, along with the probability of the model’s predicted diagnosis. review and validate the AI diagnosis, add notes, provide referral to a specialist, follow-up and treatment options. The system design also incorporates the ability to fine-tune the AI algorithm based on corrections of diagnosis errors by the specialists. Integrated administrative, reporting, and messaging for patient communication, system performance reports, and overall statistics.